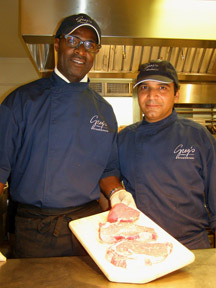 Owner/ Chef Colin Lloyd and Owner/ CEO Greg L. Wilson of Greg's Steakhouse in Hamilton, Bermuda, share their Bermuda steakhouse vision and recipes. If you could convert the energy and enthusiasm of Greg L. Wilson and Chef Colin Lloyd when discussing their restaurant and cuisine into car fuel, there would be enough power to sustain the island of Bermuda for a year. After outgrowing a prior location, Greg's Steakhouse, a 100-seat restaurant, opened in February 2007, where the address along Parliament row is as choice as the steaks. I was in Bermuda in October 2007, and had the opportunity to meet with Greg and Colin before having dinner at their restaurant. Speaking with Greg, I learned that Greg's Steakhouse is the first steakhouse in Bermuda, and that all of the beef used at the restaurant is Certified Angus Beef, of which only 8% of Angus cows are good enough to be certified. Colin said that their vision is to create a "360 degree experience when it comes to dining, steakhouses are steakhouses, but we want ours to stand out. We ask (our diners) if they would like any side dishes to accompany the steaks and if so, present them together on the plate, whereas other steakhouses serve the side dishes separately. We are always thinking of new ways to present our food." This high-powered duo clearly have their act together with the affable Greg acting as the front man greeting and seating the guests, and the talented Colin orchestrating his team from the open kitchen. Both Greg and Colin have respected culinary credentials; Greg attended the Hotel College in Bermuda, cooked alongside his grandmother, and worked in restaurants while growing up, and Colin grew up in Britain, also worked in restaurants growing up, and attended Clarendon College of Arts in Nottingham where he trained in classic French cuisine. He honed his culinary skills in Britain, Switzerland, Nevis, and the United States, before making Bermuda his home. Asked to name his favorite casual meal, Colin replied that he likes "pizza whenever I go to New York or Chicago. Good food does not have to be complex, just use the best fresh ingredients, like a simple pizza with fresh basil and a thin crust that melts in the mouth." Befitting the name of the restaurant, when I asked Greg to name his favorite meal, he of course, replied steak, saying that, "I took my first trip to New York when I was about 10 years old and went to the famous Tad's Steakhouse. I watched the chef put this big T-bone on the grill and the fire flared up, and I have been hooked ever since then." When not at working at the restaurant, Greg relaxes by going boating with his family or deep-sea fishing where his catch often ends up on the restaurant menu. As for Colin's free time, he replied that he and his wife have a 6-year old son, so as they say in Bermuda, ‘nuff said. With regards to their restaurant, Colin said "Our Dream is now a reality and we can touch it," for which Greg readily nodded in agreement. Chef Colin graciously shares his tantalizing recipe for Peppered Rib Eye (Cow Boy) Steak with Classical Sauce au Poivre. Method: Lay all steaks flat on chopping board or tray. Season both sides with kosher salt. Use 1-tablespoon of the cracked black pepper for each steak. Spread peppercorns equally on both sides of steak and lightly press into the meat. Heat heavy bottomed sauté pan until very hot. Add a little cooking oil and then add one or two steaks at a time. Cook on both sides until steaks are dark golden brown. Remove steaks when ready. Place on baking tray and roast in 400º oven for 4 minutes. Sauce au Poivre Method: Remove hot pan from stove. Add brandy. Once pan has cooled a little, place back on stove. Boil brandy until reduced by half. Add demi-glace. Bring to the boil. Add cream and reduce sauce by half. Season to taste. 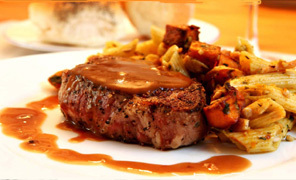 Use your choice of starch and vegetable to accompany this wonderful steak. Greg's Steakhouse is open for Lunch and Dinner from Monday - Friday, and for Dinner only on Saturday and Sunday. Read about Greg's Steakhouse in the Restaurant section. Please read other articles on Bermuda in the Destinations, Hotels and Resorts, Resturants, and Adventures sections.